Oh, it's good to be back. Feels practically like a whole new season, doesn't it? When we last left the Winchesters, Death had pulled Sam's soul back up from the pit (after Sam-less had tried to kill Bobby to save itself), and Cass had inserted that soul back into Sam, restoring him to his former self… mostly. See, Sam's soul spent a long time in the cage with Lucifer. Lucifer probably got bored with cribbage and games of MASH after the first ten minutes and turned instead to torturing the man who trapped him. Lots of flaying, poking, a general lack of proper spoonage, that sort of thing. That can't be easy on a person. Dean's spent his time in Hell, and it did a number on him, and he wasn't stuck in a room with the Thing In Charge for his stay. In order to protect Sam's sanity and give him some chance at a normal (well, normal for the Winchesters) life, Death put up a wall in Sam's mind, erasing his time in the pit. When Sam wakes up in "Like a Virgin," he's happy to be alive, hugs everybody, and the last thing he remembers is falling with Satan; the landing, and all that followed, is mercifully clouded. All well and good, but sooner or later, the truth will out. It's not surprising that Dean would try and hide what really happened from his brother. He's happy to have the real Sam back on his feet, and despite Bobby's warnings, he wants this new status quo to last as long as possible. To his mind, that means pretending that soulless-Sam never existed. This makes sense, character-wise, but it also threatens to throw us immediately back into the usual "one of the Winchesters is hiding something from the other" dynamic that Supernatural has been running ever since, oh, the first season. Just because a character decision makes internal sense doesn't mean it's dramatically effective, and while Dean's obvious delight in seeing Sam back to his old, soppy self was well done, I was concerned that the show would try and milk this drama for too long. I needn't have worried. "Virgin" was a good return to form from the long break, with a solid central mystery (in a word, dragons! ), some great lines, and a thrilling conclusion. (Well, mostly thrilling. But we'll get to that.) The dragons weren't the best monsters we've seen on the show, and none of their kidnapped victims really had much in the way of personality beyond their supposed "purity," but it was never boring, and the interview segments were short and sweet. (This seems like a contradictory criticism on my part. If I wanted more character from the missing, wouldn't I want longer interviews? But if the writers aren't going to try and distinguish this round of attractive meat products from the last, better to get the necessary out of the way quickly.) Dean's hunt for a weapon to take down the monster gave Jensen Ackles a chance to do the goofy slapstick that he does so well. The "trying to pull the sword from the stone and failing lots" was hilarious. And hey, we got a female character who wasn't a.) kidnapped (or nearly) or b.) possessed, which was nice. Best of all, Sam finds out the truth about his condition before the end credits. After noticing some odd vibes coming off Bobby and getting some weird deja vu looking at notes about skinwalkers, Sam realizes something is wrong. So he calls Cass, and Cass, not realizing that Dean was pulling a long con, tells Sam everything. Sam is, of course, horrified, and decides he needs to figure out just what his body was getting up to while his heart was elsewhere. (Anybody want to bet Sam will run into a recent romantic conquest soon? She'll slap him, or else she'll immediately want to go to bed with him.) 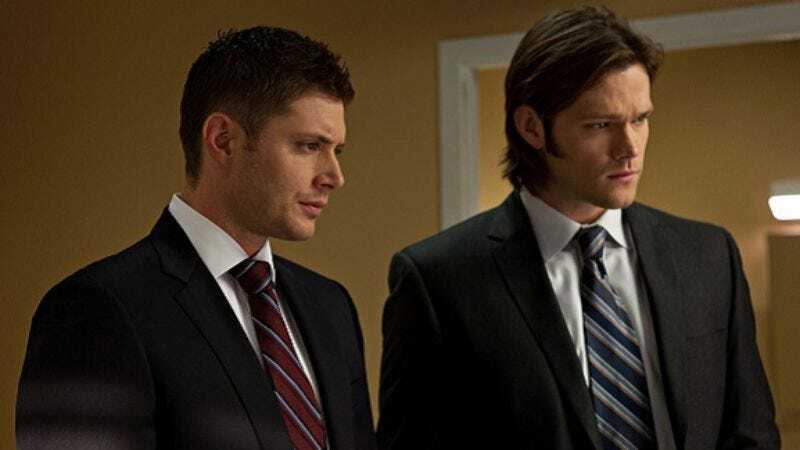 Season six has done a good job so far of moving the personal drama of the show at a good pace and not getting bogged down into the endless Sam/Dean glowering contests that have occasionally burdened other seasons. I still kind of miss Sam-less, but I appreciate the series' willingness to change up the status quo before it became too comfortable. And really, after trying to kill Bobby, it's not like he could've stayed around much longer. So, the ending. One of the dragons escapes and meets up another dragon (I assume; they both have the same outfit). While they're busy dumping a virgin into a nearby chasm, Bobby's explaining to Sam and Dean that a book they found in the dragons' lair (written on human skin) is an instructional manual for bringing someone out of Purgatory. So we've got our Big Bad for the season, the "Mother of All" that the Alpha Vamp referred to last year. I have no problems with that, but I'm a little disappointed that the big monster reveal at the end was yet another generic hottie with freaky eyes, trying to sound scary. Yeah, I get it; the virgin is possessed. (Why did they need so many? Does she burn through bodies like Lucifer did? Is she gonna eat the rest?) But the results are less than impressive. There's still plenty of time to turn that around, though. The sword Dean breaks is the Sword of Bruncvik, who was actually a real (or at least mythically real) dude. Cold open was decent, although it mostly just served to make Stan look like a moron. Goodbye, Stan. So it's weird for a 22-year-old to still be a virgin? …huh. Bobby's concerns initially make it sound like Sam will freak out when he learns the truth; nice twist on expectations that he didn't. "Did you steal that from her room?" "I loved that you even asked that."